Here in London, we recently hosted London Open Source Jam 13 (Our 14th jam, as naturally we count from zero.) - unlucky for some, but not for us! We threw the floor open to talks of any kind and we had a bumper crop of lightning talks on a diverse range of topics. We learned how to make a wiki in 58 lines of python, why open source developers should care about open standards, some new approaches to database design, and a whole lot more. Kai Hendry talked about Webconverger, a teeny weeny Linux Live CD designed for web kiosks, and his experience commercialising an open source project by offering services to go with it. 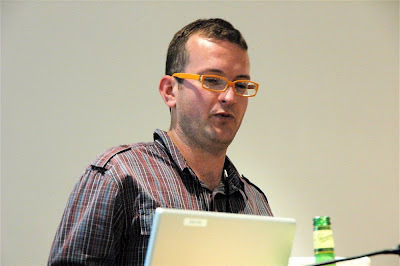 Zak Cohen shared his experiences using open source libraries in the games world in developing the award-winning game Climbactic. It turns out there's some great open source stuff out there, but sometimes paying for support is the only way to get the features you need. 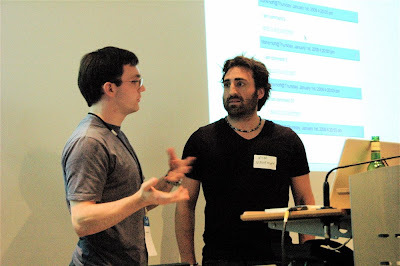 Frederik Dohr and Mike Mahemoff spoke about TiddlyWeb, a generic RESTful store for structured data, and Scrumptious, a jQuery-based web app that allows people to annotate and comment on web pages, which uses TiddlyWeb for storage. David Sheldon - Where's Java's CPAN? The OSJam website has more information about all the talks, and the photographs taken at the event are available on Picasa Web Albums. 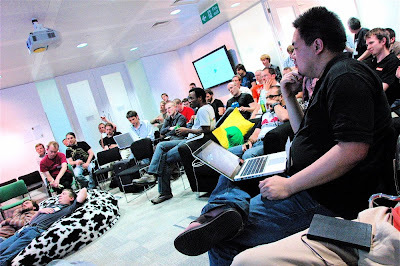 We'll be planning the next OSJam for a couple of months' time - subscribe to the London Open Source Jam Group or keep any eye on the OSJam website (Atom feed) for more details.